The Power Rack used to be the only equipment that mattered if you wanted to build muscle and a strong foundation for heavy lifting. Ask any old time bodybuilder or gym instructor or even any professional sports coach today, and they’ll say that you’re wasting your time if you’re not using the Power Rack or squat rack. Unfortunately, fitness today has become more about making a fashion statement than pursuing a healthy and active lifestyle. If you’re looking the for the best Power Rack that money can buy, our recommendation for 2019 is the Power Rack with Lat Pull Attachment By Valor. This rack showcases an extremely sturdy build and comes with all the extras. However, if you’re money is a constraint at the moment, and you’re looking for a budget Power Rack, the Cap Barbell Power Rack Exercise Stand is an ideal option. In this article, we will simplify the buying process with the help of our top Power Rack reviews as well as tell you all you need to know about training with these awesome weight racks. Our reviews cover the top power racks for sale in 2019. Power Racks and squat racks are no longer an essential muscle building tool in modern gyms. Today, gyms are full of fancy equipment that are finely tuned to satisfy the ego of new-age fitness wannabes. You will find high-tech and expensive running and cycling machines, fancy leg training contraptions, lat pulldown machines, chest training equipment, and the latest Smithsonian machines, all of which are designed to make working out easier. These machines make you feel like you’re getting a workout, but fail to deliver on achieving real results. Gyms are no longer the place to get in a real, grimy and sweaty workout. If you’re serious about building a strong core and lifting heavy, the power rack or the squat rack are your best bet. 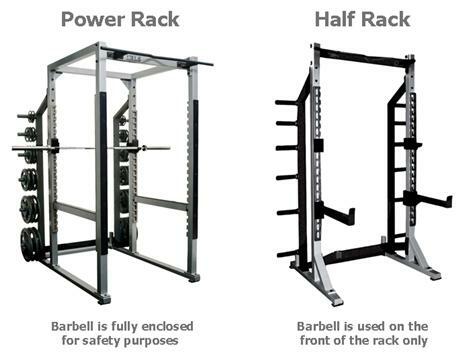 Read our Power Rack reviews to learn about the best products, features, and warranty details. What is the Power Rack? Put simply, the power cage is equipment that is designed to allow for a free weight training workout using a barbell. As opposed to its new age cousin – the Smithsonian machine, the power rack and squat rack do not impose any restrictions on movement and support a complete and holistic workout of the entire body with the use of free weight. Unlike all the fancy contraptions you see in gyms that are only useful for training one muscle or doing one kind of exercise, with power racks or squat cages you can perform a variety of exercises and work out different sets of muscles. It is truly a multi-functional equipment. Firstly, machines make the workout easier by doing half the work for you. Because machines are easier to use, beginners tend to gravitate toward them and are often encouraged by ill-informed trainers who advise them to use machines. If you are a beginner, then it is all the more important that you train with free weights and not machines. Secondly, with free weights your body is pushed to the limit and given the specific exercise you are performing, it is forced to engage the appropriate muscles that that exercise was designed to build. So, for example, if you are doing squats, then you are primarily targeting and engaging your quadricep muscles, hamstring muscles, and your core muscles (learn more about your core muscles). While performing a squat with a weighted barbell, your body is forced to engage all the appropriate muscles including your core muscles as you fight to maintain balance and form. However, the same exercise on a smith machine does not provide the same benefits or have the same impact on the body as does training with a barbell. 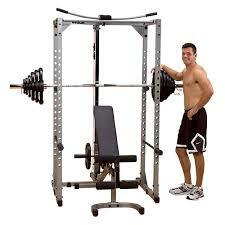 The smith machine only allows movement in a fixed plane of motion. What’s more, the Smith machine locks into an unnatural movement pattern that can place stress on untargeted body parts and not trains the targeted muscles. Finally, training with free weights on the rack all in one gym (aka power rack) versus machines is what makes the difference in the long run towards building real strength as opposed to superficial strength and muscle. As mentioned earlier, free weights force your body into utilizing its full capacity and engaging muscles that machines fail to engage. Performing key functional movements, such as deadlifts, squats, and rows with a barbell is what is going to help you make huge gains and build muscle that’ll last you a lifetime. The Power cage/squat cage is not only versatile but makes working out easier. How? Well not in the limiting way that machines make working out easier, but in helping you rack the barbell without hurting yourself or dropping the weight and damaging property. Power racks also provide adequate safety. The lateral safety pins make it easy and safe for holding and catching the barbell. The various holding pins at different heights also make it easier for you to lift safely without a spotter. You no longer need to go to a gym and pay inordinate sums of money every month just to have access to flimsy equipment and the wrong crowd. With the Power rack/squat rack, you have all you the tools you would need to build your gym at home, and listen to your music for a change! Read our Power Rack reviews on the best and most reliable products and start building your home gym today. Although, both the Power cage and the squat rack, perform the safe functions and serve an identical purpose, there are a few key factors that separate their utility. Space: This is a primary reason someone would consider buying a bench and squat rack over a power rack. Although some squat racks take up relatively the same amount of space, most commercial bench and squat racks require less space than power racks. Especially when you factor in the height of the stand. If you’re looking to build a gym in the basement with a low ceiling we would recommend a squat rack amazon, however, for a garage gym, power racks are a better option. Also, if you’re looking to do pullups as well, there are several bench and squat racks with pull up bar attachments available on the market. 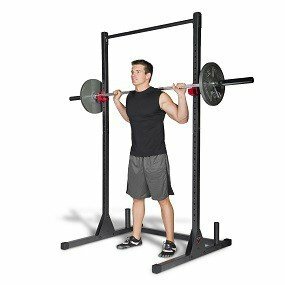 Budget: You can get a bench and squat rack for less money than a power rack, but when you choose a squat rack with pull-up bar and the safeties, then there isn’t much of a difference in price between them. If you want the extra safety and the bar, then you’re better of getting the power cage. It is more stable and reliable and much safer. Workout Preference: This is another big reason where people differ in their preference for power racks or squat cages. While some people like the security of exercising inside the frame of the power rack, others prefer to exercise outside with a squat rack. While it is the safer option to work out on the power cage frame as opposed top the squat rack amazon, because it has safety pins to catch the barbell if you fail on a rep. In the end, however, it is up to you where you feel more comfortable. Full Rack: These are the full-size weight racks that have all the bells and whistles. Some will have four uprights while other can have six, the rear two legs being for plate and accessory storage. What sets the full weight rack apart from the half squat rack and the squat rack, is that you usually exercise inside these racks and outside the half racks and squat racks. Also, they tend to take up more floor space because of the larger number of uprights. However, this is not always the case. 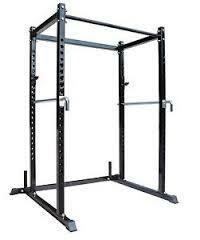 Half rack: Half squat racks have four uprights while squat stands/racks have two. Half squat racks have little space to workout inside the uprights as opposed to full racks. However, they can be equally stable as compared to full power racks, and they offer on-board plate storage. They also usually come equipped with a pull-up bar and spotter’s arms rather than the pipes between uprights like in standard power racks. If your goal is to save space and have your storage and the rack in one unit, then a half rack is a better option. The Smith Machine: This is a full-size standard power rack with a fixed barbell. The barbell is fixed within steel rails and allows for only vertical movement. Although there is a less inherent risk regarding dropping the barbell (as the hydraulic rails catch it), the fixed plane of motion greatly restricts movement and training potential. You should avoid the Smith and train with free weight instead for greater muscle building and strength training. Size & Space: Garage gym or basement gym? As we mentioned earlier, power racks and squat cages can be tall, so make sure you have ample ceiling height if you’re looking to place the rack in the basement. Before you commit, you should measure the amount of area you can dedicate to the power cage or squat rack and see if it matches up well with the dimensions of the rack itself. Remember, that in addition to the rack, there will be weights that might need to be stored on the sides. Also, factor for the barbell, which might be longer or shorter, depending on its caliber (Olympic vs. standard) and your maneuverability. You don’t want to be cramped in anyway when you’re lifting and moving heavy weights. Read our Power Rack reviews 2019 of the best power racks for sale to get information on dimensions and special features. User-Friendliness: While measuring for space and size, you should also check to see whether the rack is the right size for you. If you are a tall guy, you need to should measure and see if the pull-up bar is the right height and whether space inside the cage is ample for you to exercise comfortably. Weight storage and capacity: The best power racks and squat racks are made of strong metals that provide the perfect mix of strength and stability. If you’re opting for a half weight rack, then you should make sure that the uprights for weight storage are of good quality. Either way, the rack should be able to support at least 1000lbs or 455 kg. Stabilizers: You should look for quality construction with little or no plastic. 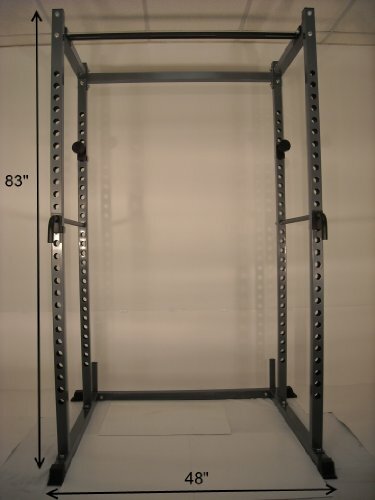 The best power racks come with stabilizers – this is a bar that runs along the bottom of the rack that helps to stabilize the structure and keep it in place. However, the stabilizer can come in the way of your feet while you’re exercising, so you want to make sure that they are both optional and removable. Anchor Holes: If you’re planning on doing kipping pullups or using an Olympic barbell or planning on attaching a dip station, it is crucial that the rack you choose has anchor holes. Anchor holes are useful for anchoring the rack to the foundation or to the lifting platform you plan on using. You don’t want the whole structure shaking and rattling when you work out. Safety Pins: Safety pins are a must. 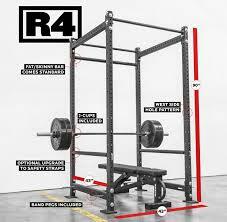 They should be movable and adjustable throughout the length of the front uprights on the weight rack so that you can bench press and floor press as well as perform reverse pushups. Check for functionality as well as the tensile strength of the pins to ensure that they are capable of catching the weight you are going to lift. Accessories: Setting and realizing that it does not have the accessories you want can be extremely frustrating. So make sure to read the print carefully to see whether the power rack you’re considering has all the bling you want. Some accessories that are most widely available include a pull-up bar, a lat pull-down machine, a dip station. Also, bear in mind that in some cases, accessories are compatible with different brands. For instance, if you have a 2″x3″ squat+pull-up from Fringe sport, you can attach most Rogue Infinity accessories. Read our Power Rack reviews to learn about the best power rack for sale in 2019, which includes the solid Titan power rack with pull up bar. This Atlas power rack is the perfect mix of price and quality. So, if you are on a budget, and you want the best of both, worlds, this is the product for you. The rack weighs a decent 137 lbs and makes up in tensile strength and overall build quality for what it lacks in weight. It made of heavy duty steel, which provides stability and can carry up to 800 lbs in weight! The four uprights that hold this awesome rack up, all contain 28 holes that are 2″ apart for adjustments. The rack itself comes with 1″ round solid steel safety pins, with lock-on design and chrome plating. The rear plate holders on this Atlas power rack are great for storage and stability. This Atlas power rack comes with a built-in knurled pull-up bar that is 83″ from the floor, which works great even if you’re taller than average. According to several customers, the safety pins/spotters work great and catch up to 300-500 lbs comfortably even from 1 foot away! This Power Rack by Valor weighs 90 lbs and has an extremely sturdy build. The frame is a gauge with 2″ X 2″ Steel Tubing. It comes with a solid steel chrome pull-up bar that just the right height at 82″.When it comes to the design and build, the quality of the design isn’t limited to its visual appeal, but far surpasses it. Each bar holder can comfortably hold 500 lbs, so you can rack up without any hesitation. The assembly process can be tricky, so we recommend that you hire a professional or better yet get a friend who has some experience to help you out. The max weight on the lat pull-down is 250 lbs, which is more than adequate unless you’re the Hulk! There is four weight plate storage pegs; 4 solid steel, chrome adjustable weight bar supports; 2 solid steel squat safety bars; and 17 variable positions for bar supports on the uprights. With an affordable price, free shipping, and a decent built, this Titan power rack is a pretty great choice for beginners. It comes included with 1-inch round J hooks and 2-inch steel tubes. The chin-up bar is 1 1/4″ in diameter and rests at a comfortable height of 83″. If assembling seems cumbersome to you, then the instruction manual provided can be quite helpful. The uprights have 28 positions to help accommodate for different positions and exercises. 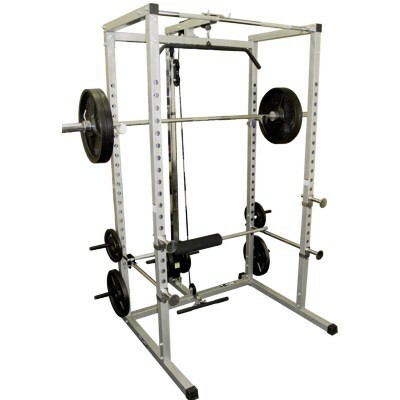 Ths Titan power rack is made of good quality steel bu it doesn’t deliver on the same sturdiness as high-end power racks. The rack itself weighs a little over a 100lbs and can support close to 700 lbs of weight, which is pretty commendable given its frame. The J-hooks are great for safety and are easy to use and install. Although, the cross through plates are thin, they sit pretty comfortably on the cross members, the pull-up bar, and the feet thin. However, one feature that does pose a problem is the number of anchor holes on the feet. This Cap Barbell squat stand is a great product to kick start your strength training program. Unlike most squat stands, this stand comes with a pull-up bar, so you can go to work on your lats and back as well. The unit allows for a variety of heavy lifts (squats, deadlifts, military press, bench press) as well as resistance training (with pull-ups, chin-ups, etc.). The pull-up bar is made from high-grade tubular steel which is fully welded to mounting plates for reinforced support. All the steel on this squat stand is powder coated and sealed, and the bar holder has an ABS sleeve to prevent scratching the bar while dropping or removing the bar. Not only is it a high quality finished product, but the manufacturers also paid close attention to safety during the design and built process. All open frame ends are capped, and the main frame is built using 12 and 14 gauge steel. The stand uprights are accommodated for 30 different positions which allow for a variety of exercises and movements. There is the option of mounting the uprights to the floor for added stability. To learn more about this product click the link below. The Power Rack truly is an invaluable muscle building tool. It has everything the gym offers and more. Its simple design allows for a variety of essential body building and strength training exercises. So if your goal is to increase muscle mass (size) through progressive overload or to increase strength through resistance training, the rack supports every approach to training. With the Power Rack, you’re home gym is complete and ready for serious training and huge gains! There are numerous different types of power racks in the market, including many variations in the basic design. However, whatever your goal or requirement, our Power Rack reviews cover the widest range of products that are available in the market, and we are positive that you will find all the information you need to get the product that bests satisfies your needs and goals. Good luck and remember, no pain, no gain!